Ever since The Flash returned from the mid-season break, the show has witnessed an acceleration of crazy. From Wally West's appearance to Harry's secrets to Zoom's threats, Barry has his hands full... and now, he not only has to deal with his Earth's problems, but he's involved himself in Earth-2's. Talk about super. Here's what's been happening on The Flash, season two. The Flash Episode 11: "The Reverse-Flash Returns"
Eobard Thawne, the Reverse-Flash, Barry's nemesis, has found himself stuck in time. But this isn't the Eobard Thawne Barry has come to loathe. This is a younger Thawne before he becomes obsessed with destroying the Flash. This is the villain's origin story. 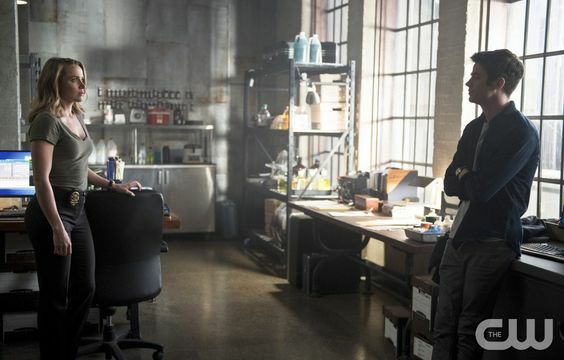 Thawne tries to return to his own time by forcing Dr. McGee from Mercury Labs to help. Thus, Barry learns his enemy has returned. But Barry is so shocked, he's unable to stop Thawne. He retreats back to STAR Labs to share the news. Cisco tries to "vibe" in order to find Thawne, but it doesn't work. He's frustrated he can't control his powers. Thus, Harry decides to help him out--by scaring the "vibes" out of Cisco. Harry dresses up as the Reverse-Flash and startles Cisco into a "vibe." 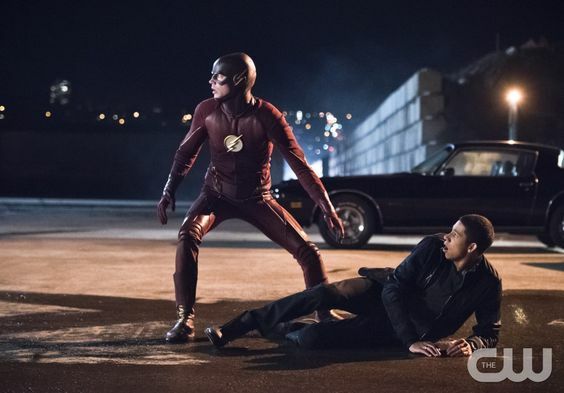 Barry tracks down Thawne, chases him across the city, and almost beats him to a pulp. His team pulls him out of his rage, directing him to bring Thawne to STAR Labs. Cisco decides to talk smack to the imprisoned Thawne, but it doesn't go well. Cisco ends up in a seizure-like state, followed by a coma. Harry explains if they keep Thawne locked up, it will rupture the timeline. The only way to save Cisco is to send Thawne home, which will pave the way for Thawne to kill Barry's mother, a fixed point in the time stream according to Harry. Meanwhile, Patty figures out Barry is the Flash. She gives him plenty of opportunity to openly admit it, once and for all. But he doesn't. He doesn't want her to be stuck in Central City with her life in danger because of him. So he lets her go. But Patty isn't ready to give up. On her train ride out of Central, she fakes an armed attack, which propels Barry as the Flash to her aid. He lets her see him, Barry, as the Flash before saying goodbye. Iris says her own goodbyes as well--to her mother. Francine is on her deathbed with only a few moments left. Iris sits with her, giving her forgiveness for everything that happened and whispering goodbye. Caitlin tries to find a cure for Jay, hoping to use Jay's Earth-1 doppelganger. But he doesn't have one. On Earth-1, Jay's doppelganger was adopted and named "Hunter Zolomon." (Which is... you know, the name of the third incarnation of the Reverse-Flash/Zoom.) Thus, they let it go and decide to focus on the only thing to help Jay: defeating Zoom. 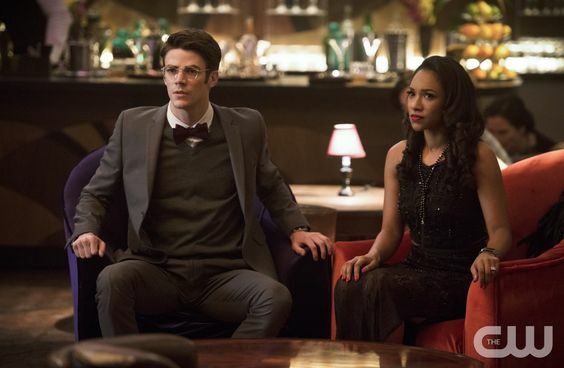 The Flash Episode 12: "Fast Lane"
A new meta-human emerges from a tar pit to exact revenge on the people who threw him into the tar pit the night STAR Labs exploded. His abilities include: transforming into tar and hurling fireballs. Thus, Cisco dubs him: Walking Tar Pit. (So clever, Cisco.) Barry is able to stop him temporarily. They look into the man behind the tar, Joe Monteleone. They recognize two of his associates, who become his previous victims. But the third associate is a mystery to everybody. Everybody except Iris. The third man is the man currently ruining her brother's life with the street racing. Earlier, Iris--being the BAMF she is--confronted the man to stop the races. He threatened her too, but she recorded the entire message, promising if he hurts her the entire CCPN will hear. (Okay, this is the first episode I truly enjoyed Iris' character. You go, girl!) He lets her go, but she got what she needed to take down the street racing and save her brother. Thus, when Tar Pit decides to attack, the team is ready. Of course, he attacks during one of Wally's races, which cause him to swerve out of control. Barry--as the Flash--arrives in time to save him. But he's not able to completely save everybody. Broken glass from the crashed car spins toward Iris, but Barry finds he isn't fast enough to stop it from stabbing her in the shoulder. She lives, but she's injured. And Barry is horrified he wasn't fast enough. The Flash Episode 12: "Welcome to Earth-2"
Barry, Cisco, and Harry prepare to travel to Earth-2. They've found a way to close the breaches, leaving one to jump through. With Caitlin and Jay's expertise, they zoom through the portal. And in the time tunnel, things flash by. More precisely, people flash by. There's a shot of Supergirl--yes, Supergirl, the Supergirl* from the CBS show--flying. They see Jonah Hex, Gorilla Grodd, Green Arrow, a legion ring, and the 90s-version of the Flash. (These shots suggest tons of fun to come for our time-traveling, universe-hopping speedster.) Then, they reach Earth-2. *It's been confirmed that a network crossover episode between Supergirl (CBS) and The Flash (The CW) is in the works. Barry Allen (played by Grant Gustin) will appear on Supergirl in March! **This episode was full of hidden Easter eggs and references to the comics. For a well-developed list, check out this site here. What did you think of recent episodes of The Flash?